If you’ve been searching for a used SUV that can offer you the interior space you need every day, a Ford Expedition is the perfect vehicle for you. 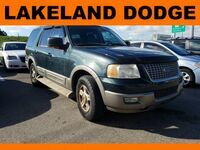 With its cavernous interior and a lengthy list of features and options as well as its incredible versatility and capability, a used Ford Expedition in Tampa, FL checks every box. The Ford Expedition is a full-size SUV that can carry up to eight passengers when choosing the second-row bench seats. It offers a large and spacious seating area and an enormous amount of cargo space. It is available in many different trim levels, so you can get all the family features, high-tech gadgets, luxurious comfort options and safety technologies you want and need in a used SUV. For an SUV to be as capable as you want and need it to be, it must have a powerful engine that can deliver the horsepower and torque you require. A used Ford Expedition in Tampa, FL receives a turbocharged EcoBoost® V6 engine that can put out an incredible 365 horsepower and 420 lb-ft of torque. With that much power and torque, you’ll be able to tow up to 9,200 pounds when properly equipped. When it comes to versatility, the used Ford Expedition has a lot to offer you. With seating for up to eight passengers and a whopping 108 cu-ft of cargo space, you’ll have all the room you could every need. If you’re looking for superior traction control on slick road surfaces or off-road trails, a used Ford Expedition also offers four-wheel-drive.